A nourishing, hearty, nutrition dense Broth. Our recipe is loaded with nutrients that will keep the whole family healthy from old to young. Bone broth has been known to improve immunity, support joint health, aid metabolism, promote gut health, fight inflammation, build muscle, improve your mood. Kidney beans are high in protein and contain tryptophan which improves your sleep, improves your mood. If the diet had natural sources of tryptophan there would be no need to take anti-depressants. Many are prescribed anti-depressants for low mood. The key is to look into good nutrition and if you have any deficiencies.In addition to any emotional trauma. 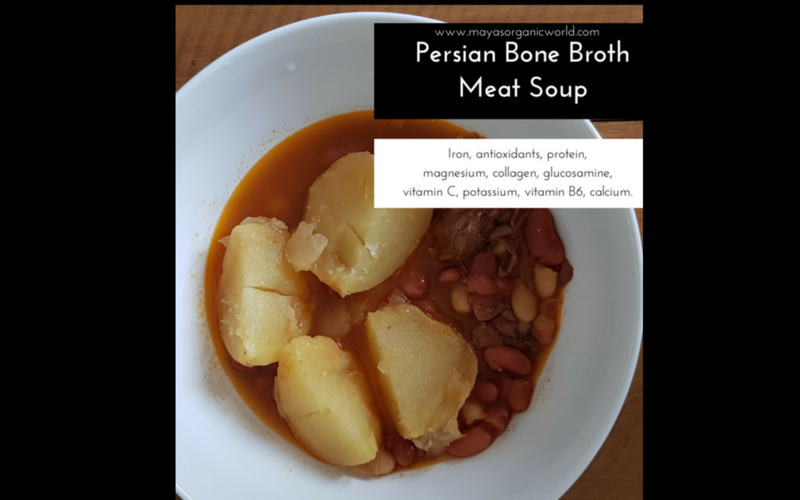 The Persian broth also contains potatoes which are high in vitamin b6, which is essential for healthy nerve function, liver function and eye health. Many tend to go on low carbohydrate diets and ignore key staple foods that have been part of many diets over the centuries.At Maya’s Organic World we promote balance and biochemical individuality. What suits one person may not suit another as long as you are eating a pure diet. Organic lamb bones with marrow. Soak your kidney beans, chickpeas or white beans over night or for 4 hours. If you are using tinned then omit this step. Saute onions in ghee, once the onions turn a golden color add the organic bones and saute. Once the meat is slightly golden, add water, a dried lime, seasoning, 2 table spoons of tomato puree and then stir. After 6-8 hours on low heat add the beans and cook for a further 1-2 hours, lastly add potatoes. If the beans are tinned add the beans and potatoes together. Iron, anti-oxidants, protein, magnesium, collagen, glucosamine, vitamin C, potassium, vitamin B6, calcium.